The 29-year-old is out of contract this summer but has been offered a new deal to remain at Tynecastle. 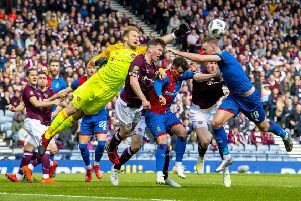 Manager Craig Levein said in January that Djoum, who turns 30 in a fortnight, was “at an age where he wants to get one last big contract in his professional career” and admitted that the key midfielder may be able to get a more lucrative deal elsewhere, with French top-flight side Toulouse among those credited with an interested. Djoum, speaking about his future for the first time since he became free to speak to other clubs regarding a potential pre-contract, told the Evening News he is remaining open-minded.